We currently use my old computer as our media centre, But the word old says it all. The hard drive is starting to fail (currently 5 pending sectors) and it consumes way more energy then I’d want. Our television is a 5:4 19″ HD-ready TFT monitor from 2004, which is not ideal to watch movies and other video. Therefore we started planning on an upgrade of this equipment. So, what’s the big fuzz? The Raspberry Pi is a small ARM Computer with a double core GPU, all for the small price of $35 (B Model). It can easily run the custom build Debian distro included. Boot time: about 20 seconds. Power Cost: max. 2W. Incredibly low compared to my old machine 😉 It wa sdesigned as a small computer for educational purposes, but it can fit a lot of needs. Think robots, automatic beertenders and such. So, now I want another! To install XBMC on! This awesome piece of media centre software has been ported to the Pi. 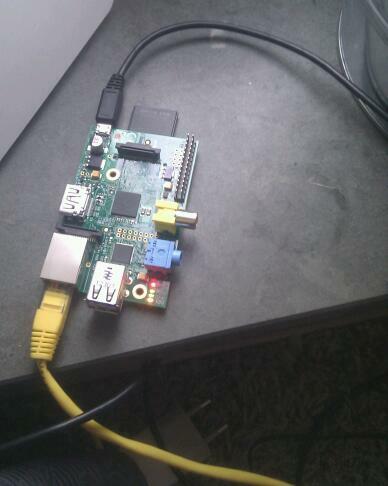 And since the Pi has a Full HD Capable GPU, I can use one as my new, less power consuming media centre! Awesome! But as I still need some hard disk space to save all my awesome files on, I will need an external HDD + powered USB Hub, since the Pi cannot deliver so much power over USB. Also, my USB-TV card is now supported in the 3.6 kernel (Which Raspbian is based on) So I don’t have to build the drivers every time my kernel gets updated (Hallelujah!). For the external HDD I will use my current laptop HDD, which I am going to replace with an SSD, because SSDs rule, and my laptop could definitely use some performance increase. I have composed a small buying list (excluding the Pis). I will add these peripherals to my mini home server, instead of my media centre, since the server will always be online, and my media centre will not. I also use the server for backups, so it is a good idea to make the server act a bit like a NAS. We aren’t sure yet about the new TV but the Samsung UE32EH5000 looks very promising, considering our needs and budget. This entry was posted in archive, tech and tagged DIY, home, home server, media center, nas, pi, raspberry by mj. Bookmark the permalink. I love it! Here, have a cookie..
I’ve got a same sort of set up! Also, if you add CouchPotato (with an IMDB watchlist) and Sickbeard connected to sabnzbd you’re all done.